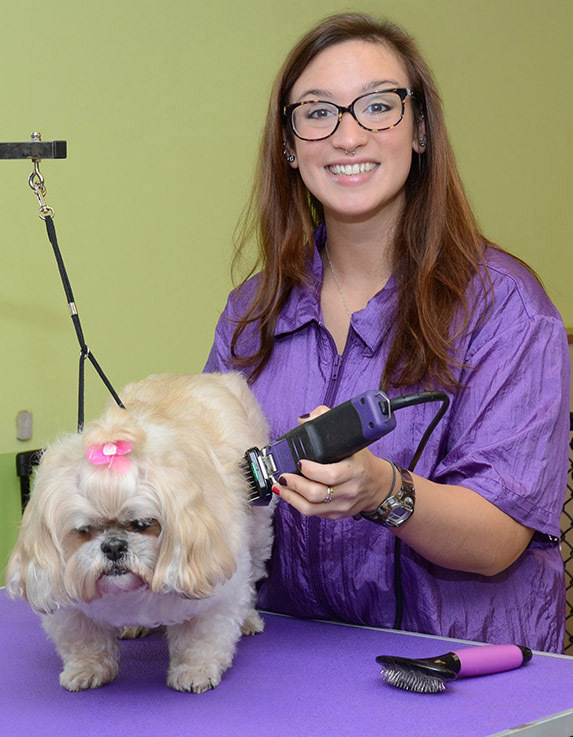 Groomerella’s dog salon is an upscale hair salon for your pooch! Offering prompt appointments Wednesdays-Sundays by appointment only. Quality dog grooming with Love! Whether it’s a tidy up or a major transformation Stephanie and her staff are ready for any job! Closed Mondays & Tuesdays. Stephanie has been in the grooming industry since her early teens working as a bather. She always had a way with dogs and they seem to like her too. She had the opportunity to learn from other successful groomers who taught her all the proper grooming techniques. Over the years Stephanie, with experience and research, has developed her own personal flair and signature grooming style. She is now the proud owner of her own salon. She absolutely loves what she does and doesn’t considerate a job, it’s her passion! Stephanie in a very confident groomer knowing all that she knows and is truly blessed for having her own business that is shared with her mother Marcella a tailor by trade. We carry some products for your dogs specific coat. Ask Stephanie what she recommends for your dog. One vitamine we recommend is Pet Health. for this service. We can shave the dog at no extra charge at your request. grooming is very beneficial to your pet’s physical and emotional health. Insuring nails are clipped regularly your pet can walk and play as hard as they would like. This helps prevent paw injury and paw joint discomfort. Staying on top of your dog’s ear health with regular grooming's and ear cleanings can help detect and prevent infections. A good bath and brush out helps wash way and remove all dirt debris that your pooch has been carrying around and aids in healthy air flow to their skin and coat. As we know we all feel better after we're clean!